AVI-SPL has qualified as an InfoComm International AV Provider of Excellence, or APEx, making it the first multi-national integrator certified through the program. 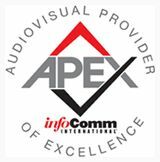 The InfoComm APEx program is a marketing recognition program for integration companies and AV design consulting firms dedicated to upholding industry excellence by providing quality service to customers. The InfoComm APEx program recognizes companies based on the number of employees holding key industry certifications, including InfoComm’s CTS credential, completion of continuing education classes, and positive customer survey responses. APEx providers must also prove that they meet or exceed the requirements within two ANSI/InfoComm standards — the Standard Guide for Audiovisual Systems Design and Coordination Processes and the AV System Performance Verification Standard — to foster better communication between the AV provider and the client.